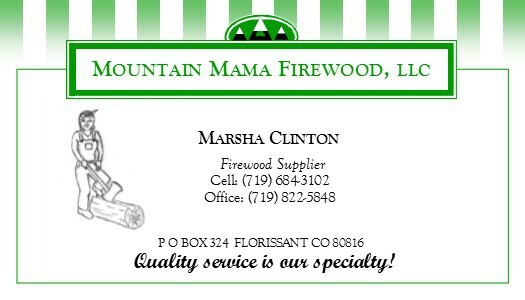 Mountain Mama Firewood, LLC started as an idea three years ago. After much planning, research, and a whole lot of faith in me, my loving husband, Jon, invested in some equipment to get me started in forming our partnership of Mountain Mama Firewood, LLC. Knowing it was going to be hard work, and tricky to run a business and still be a good wife and mother of five, I'm proud to say our business is blooming!! Although we have only been in business for about a year now, it has been a great experience and I enjoy it very much. I admit that it is very tough work but I take pride in knowing I can do it. And we, as a family business are growing! As we are growing, we are looking into different types of wood, and are hoping to have a variety of both soft and hard woods available for next winter season. Until then, lodgepole it is. We appreciate you taking the time to get to know us, and look forward to fullfilling your firewood needs.